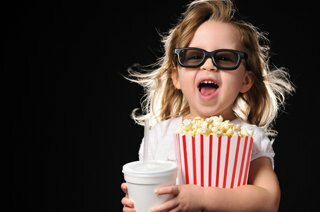 Kiara was 5 now, a perfect age to take her to the movie, her mother, Kanak thought. She had now entered a big school, and was no more going to crèches or play schools. The biggest screen she had seen till now was the 46-inches LCD screen TV at her home. According to her, it was the biggest screen as the TV rooms in her play school, had the traditional box-styled television sets, which no more amused her. ‘Who is this?’ Kiara picked up the newspaper, and asked Kanak. Kanak examined the newspaper, there were a lot of advertisements and news filled in it, but Kiara was pointing to a specific corner of the paper, which had a photograph of the star of the millennium, Mr Amitabh Bachchan. Kanak knew, explaining about this great personality to her little soul would be a difficult thing, but she was also a stubborn child, with a curious mind. Kanak laughed, Kiara had a long way to go, still. ‘No…! It’s a toy, not a pet!’ she couldn’t stop laughing. Kiara stared at her blankly, still wondering what was there to laugh. ‘You know, you’re too sweet…you’re my pet, aren’t you?’ Kanak snuggled and cuddled with her, pulled and kissed her cheeks and her forehead, she tickled her tummy and Kiara giggled and laughed. Mother-daughter time was best spent in the evening, when Kiara’s father was at work, and Kiara would discuss all the stupid things with Kanak proudly. Kanak herself was a proud woman for have given birth to such a curious beautiful thing. ‘Movie? What movie?’ Kiara was diverted from the haircut to the movie. Just as Kiara’s mother went to Kiara’s room to get a dress for her, she heard the phone ring. It was her husband. ‘Okay…as you say…try to be home soon, please! I miss you…love you…’ she hung up and went back to Kiara’s room, to search for a suitable dress for the evening. It was an important day for Kiara as she was going to watch the first movie of her life. She chose a beautiful pink dress with white lace covering it at the borders, and a pair of little white sandals to match up. Kiara was watching the trailer of the movie on the TV with anticipation and extreme curiosity. ‘Yeah, remember! Granny got it from America, it’s a brand new one, I remember!’ Kiara shouted. This was the tenth time she was wearing the same dress, and still Kanak reminded her of its newness every time she wore it. Kanak locked her room and changed her clothes. Kiara was sitting outside, and admiring the white lace at the border. The velvety soft lace seemed tempting to her, she picked up the border, and chewed some lace to taste it. It was tasteless, means, useless! Within a few minutes, Kanak was ready, the door opened up and Kiara got up setting the border, and trying to avoid Kanak from looking at it. ‘Show me…you chewed it? Tell me the truth…’ Kanak asked her. She could see the saliva marks on the lace and it was also torn from a few places. The delicate fibre strands broke as Kiara tried to chew it. There was nothing new to it though, every time she wore that dress, she always chewed the border-lace to taste it, but it never turned of chocolates. Kanak would always scold her, but the little kid never understood that clothes couldn’t be turned into chocolates! That saccharine movie released a year ago, impressed Kiara so much that the day she watched it, she licked, bit, chewed, and tasted almost everything in her home to check if anything was made of chocolates, but all she got in return was disappointment. Nothing tasted like chocolates, rather some things were really bad in taste, like the spoonful of coffee powder she tasted in disguise of chocolate powder! From that day onwards, Kanak kept the coffee in the topmost drawer, where Kiara could simply not reach. ‘Come on…we’re late!’ Kanak picked up tiny baby Kiara and made her sit on the back seat of car. She then fastened up her seat belt. ‘No excuses…sit tight, we’re leaving!’ Kanak pressed the accelerator and she drove the car to the mall. As they reached the mall, Kanak witnessed a huge crowd outside the mall. She was suspicious about the tickets now. She parked her car in a secluded area, got off with Kiara, and reached the ticket counter within ten minutes. Half of the show was sold out and only a few selected tickets were left, and that too of front rows. ‘Mom…no…please, mom!’ Kiara’s eyes welled up with tears. ‘Ohh…come on, my baby! Don’t cry, brave girls don’t cry, right?’ Kanak patted her back, but Kiara wasn’t ready to negotiate. Shine had impressed her too much now, and she wanted to watch this movie right now at any cost. Kanak called up her husband, who listened to half things and said a blunt ‘yes’ as he was stuck in a meeting himself. Kanak finally bought the tickets of second row. She didn’t want to see the movie from so close, as it could affect Kiara’s eyes, but her stubborn daughter wasn’t ready to listen today. They entered the multiplex, and the smell of freshly popped pop-corns filled it. Kanak bought a large tub for Kiara, and she started munching right there. ‘Mom, you always keep calculating so much…’ Kiara stuffed her mouth with another handful of popcorns, and the announcement of movie could be heard around. ‘Come on, Kiara, fast…the movie has started!’ Kanak picked her up and entered the movie hall. She showed her tickets to the officer standing at the entrance and he guided her to her seats. She then placed Kiara on her seat who was astonished to see such a huge screen for the first time in her life! Kiara mocked her mother by placing her index finger on her lips and signalling her to keep quiet. Soon, the advertisements started playing. Kiara looked at her with amazed eyes. If the movie didn’t start, then why were they showing things on the screen? Soon, all her questions were answered, as shine emerged on screen. ‘Mom! Look, it’s shine! He’s so big!’ stars shined in her eyes, brighter than they would shine on screen! ‘Kiara!’ Kanak warned her this time that either she’ll watch the entire movie quietly, or they’ll go home right now. The little girl knew well what to do. She sat quietly for the next three hours and enjoyed the movie. Looking at her mother at random intervals, with questions and words in her mouth, but then she preferred to remain quiet. ‘Can I speak now?’ Kiara hushed to her mother. ‘Not here, on our way home. Now come-on, and stay with me. Walk with me, Kiara!’ Kanak told her to hold her hand, but she instead held a corner of her kurti. Kanak could feel her walking beside her. There were so many people in the movie hall that an entire world seemed to exit the hall as the movie ended. As Kanak reached outside the cinema-hall, she looked around her, Kiara was nowhere to be seen. She was horrified, she rushed inside the theatre, searched all around, but didn’t find her. She started crying and screaming, her only daughter of 5 was lost in the crowd. The theatre officials made several announcements, and the guards sealed the cinema-hall entrances and exits, but no use. For the next one hour, nobody had any clue about Kiara. Kanak was almost half dead by crying and weeping. She called up her husband, Pranav, who reached within minutes, upon hearing the news of his daughter’s disappearance. ‘Hey, Kanak!’ Pranav shouted from outside. ‘He’s my husband, please let him in…’ Kanak was crying. Pranav hugged her tight and consoled her. Then he calmly asked her about what happened. Kanak narrated the whole story in a single breath, she was being restless about her daughter. Pranav was worried more than anyone, but he tried to stay calm and composed. He filed an FIR immediately and police arrived, they searched the mall, the toilets, the trial rooms, but no clue. It was 01:00 am, but still nobody had any idea about Kiara’s whereabouts. 24 hours passed, Kanak was sick and tired, and Pranav was worn out. They filed a missing report of their little angel. Nobody had a hint, such a thing would happen in a fraction of a second. ‘Sweetheart, there’s no use of blaming anyone now…we have to be strong right now and not weaken ourselves by putting allegations…calm down, relax!’ Pranav caressed her and tried to calm her down a bit. Soon they got a call, about a girl who was recovered from a dump. It was a little baby girl, Pranav and Kanak were called to identify. The girl was hospitalized immediately, she had a bruised face, that made it difficult to recognize her. As Kanak entered the hospital premises, she just prayed that it should be Kiara. No matter hurt or bruised, at least she was alive! Within 24 hours of her disappearance, they had lost all hopes of her survival. Being a small girl, without any knowledge of the world, how could she survive even one hour, let alone one full day on her own? They reached the general ward where a police official met them, and guided them to the little girl’s bed. ‘Oh my God! Kiara…’ Kanak broke down. It was Kiara. Her clothes were torn, but still her pink skirt was identifiable. Pranav placed a caring hand on Kiara’s head. She was partially conscious, mumbling in her sleep, with a couple of needles injected into her veins and flushing her blood with various medicines, the little soul was fighting to survive. ‘What happened to her, officer?’ Pranav asked. Kanak fainted as she heard that horrendous news. Pranav was set aback, he held the officer’s shoulder for support, and started crying. Soon they witnessed a steep fall in her heartbeat. The nurse gave her shocks, but the pulse-rate was falling rapidly. Doctors were called, she was taken to operation theatre, but her little body couldn’t bear such a horrible act. It gave up, and everyone’s loved and adored Kiara went to heavens. true ….not this 5 yr old evn 8 mnth old infant how can she make dem provoke to do this …..n dey se its our fault.bcoz we wore shorter cloths…..so true….shameless people …..
We can’t change mentality of sick people, Prachi. They are born with a tendency to commit a crime. Sadly, all we can do is to educate people around us.